When you’re zooming through space in No Man’s Sky, sometimes you’ll hear what sounds like a clap of thunder. That’s a freighter warping in. Freighters are massive ships you can use to haul loot. If you don’t have a freighter of your own it can be hard to figure out how to get one, or what to do with one when you have it. Here are some tips. It’s easier than you might think to get a freighter. You can buy one if you land on a friendly ship and talk to the captain, but they range in the millions of credits. Early on, it might be a challenge to save up that much money. The good news is, it’s actually super easy to get one for free. If you are in a system and see an NPC freighter being attacked by enemy ships, lend a hand. Once you’ve defeated all the ships—you’ll have help from ships in the freighter’s fleet—board it and talk to the captain. He’ll tell you he’s tired of running the ship and just hand it over to you. Score! A freighter is useful right away, especially if you want to have multiple ships and stockpile supplies. Think of it like a giant floating garage: put all your ships and crap you’re not using on it. You can house any ships you buy in the landing pad, and a regular class freighter has up to 19 slots for storage, with more on larger freighters. When you’re on a planet, you can send anything in your inventory to a freighter, but you’ll have to be on board it to get it back. You can also summon your freighter to you while you’re in space, but sometimes it’s tricky to find a clear area to put it since it’s so big. 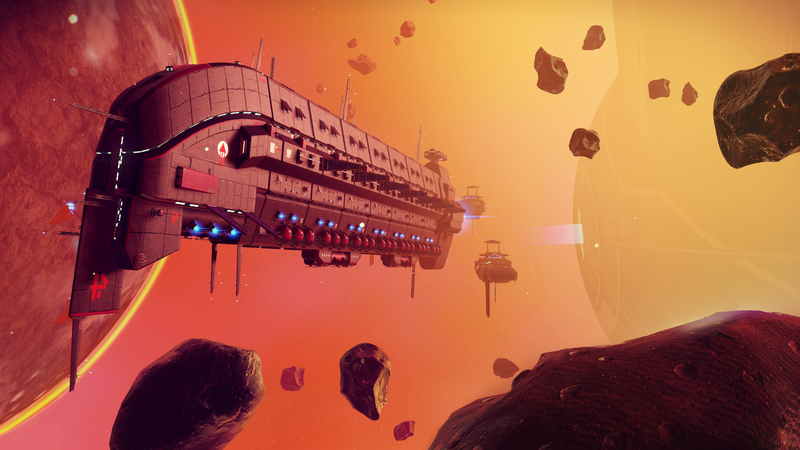 No Man’s Sky actually gives you a little tutorial on how to use freighters in your guide menu. The first thing it’ll prompt you to do is build a Fleet Command Room, which you can find in your build menu. Building this takes silver, gold and tritium, all of which are easy to find by shooting asteroids. After you build the Fleet Command Room, you should talk to the ship’s navigator on the bridge to receive the blueprint for making frigate fuel. You can build out your freighter’s interior like you would any base, adding rooms and hallways where the game tells you it’s possible. The Fleet Command Room allows you to oversee expeditions, which are a little bit like the War Table in Dragon Age: Inquisition. When you talk to the ship’s navigator on the bridge, you’ll be able to select missions, which have different categories of difficulty and lengths of time to accomplish, and then select a ship from your fleet of frigates. There are a couple other things you can do from the bridge of your freighter. You can inspect your fleet and also warp to other systems. Frigates are ships that are bigger than your personal ship, but smaller than a freighter. Up to five of them can assist on an expedition, and they have specific specializations, from exploration to combat. You can check up on any expedition from the Fleet Command Room, where a little hologram of your pilot will tell you how everything’s going. You can tool around the universe until that expedition is over, unless you’re on the ship that’s doing the expedition, in which case you won’t be able to leave it. When it’s over and the ship returns, you’ll get some credits and rare resources. It’s a pretty good racket, but there’s also a chance your ship could come back damaged and you’ll have to use resources to repair it. Getting the hang of managing your frigate fleet from your freighter can be very profitable. Last night I checked in on an expedition and received 151 Emeril, which is a very rare resource I can either sell or use to craft new upgrades. Either way, expanding my fleet is next on my very long to-do list in No Man’s Sky. Hopefully you’ll also start off on the right foot with a free ship and a fruitful expedition.